Q: Are you glad it’s over? Sen. Hart: No, I wish I were the nominee, but I’ll campaign for the party nominee. Q: Do you think you could have beat Reagan? Q: Would you have had a better chance than Mondale? Sen. Hart: I don’t want to make that comparison. I’ll do everything I can to help the ticket. I hope Mondale wins, and I think he can. Q: Do you think it’s hard to run for public office today? Everything is so scrutinized. Sen. Hart: I think that the press has to cover politics differently. Q: Do you think that you’re being fair? Sen. Hart: I don’t want to get into that. I’m not in the business of judging the press, but I would just say, particularly for those who announce for the presidency…the personal kind of scrutiny that’s going to occur, ought to be done well ahead of time. The press does not need to wait. Sure, after you’ve won the New Hampshire primary, it does descend on you. Q: With Geraldine Ferraro for example? Sen. Hart: Her case is different. Q: Nobody had time. Not even Mondale had time to scrutinize her background. Do you think what is happening to her husband is fair? Do you think he should be put through that? After all, he’s not the one running. Sen. Hart: The family gets elected whether we like it or not. Lee is in the real estate business. If she had any shady or questionable dealings, I would have been pursued, and I think probably rightly so. I think it’s a question of not whether, but how. Q: John Zaccaro has been vindicated for the most part, but they’re still making an issue out of it. Sen. Hart: “They” are your profession. I’m not going to be in the business of judging journalism. Journalism has to be self-regulating. Politicians can’t decide what to write in journalism. You all have to decide yourselves whether you’re doing your job or not, and when the boundary line is crossed. Lee Hart: I think it’s more of a partnership today. I think, frankly, when you seek the public trust, you owe every possible scrutiny that’s within legitimate bounds for the public to be able to place their trust in you. Unfortunately, those who are in public office or running for public office today are having to bear the burden because of abuses in the past. When Gary first ran for United States Senate in 1974, there was no financial disclosure law. We disclosed every possible thing, including our income tax return and we’ve done that every year since. Q: Do you file a joint tax return? Sen. Hart: It doesn’t matter. For 11 years now we’ve released our tax returns. When I ran in ’74, I said I thought it would take this country twenty years to get over Watergate. I think that’s exactly what’s going on. Q: The public doesn’t want to be tricked again? Lee Hart: I don’t know that the public has been fooled on this particular issue. Sen. Hart: The public’s been told more than it wants to know. Lee Hart: I do think the voters want to have confidence and place trust in people who are seeking office, particularly the two highest offices in the land. Therefore, I think that’s a part of it. The new problem that’s been coming about, and particularly with Ferraro, is that with more and more women running and holding public office, the spouse may well be the main breadwinner. It’s one of the things one has to take into consideration when they’re running for public office. We are partners whether we like it or not, in a far greater sense than a husband and wife ever were before. 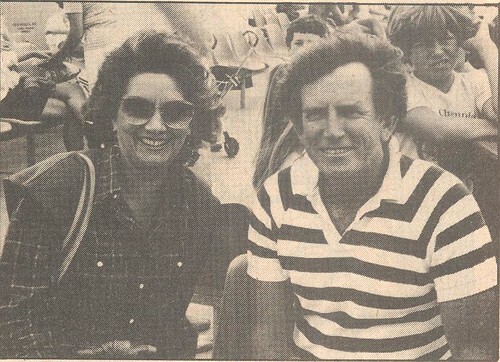 Lee and Senator Gary Hart on Martha’s Vineyard in 1984. Q: What do you think are Mondale’s chances? Sen. Hart: I’ve talked to him and he understands it’s an uphill fight. The polls show him to be a few points behind, but that can change very rapidly. Q: What would four more years of Reagan-Bush mean? Sen. Hart: An increasing escalation of the nuclear arms race, most frighteningly, a further decline in government commitment to a clean environment, a further deterioration of social programs necessary for children and the elderly, education and health programs, a complete abandonment by the administration of a meaningful social safety net and increased hostilities in foreign policy. Q: Are we the “good guys” anymore in our foreign policy? Sen. Hart: It’s mixed. In the third world, the more we conduct overt-covert wars in Nicaragua, the more we align ourselves with regimes like the Marcos regime and the former Somoza regime, the less we are. Q: Should we have a “hands off” policy in Central America? Sen. Hart: No, I think we have an interest there, both a national security interest and a spherical interest, but also an economic interest. We can promote democracy; we just don’t need to do it with the barrel of a gun. Q: Let’s go through some of the Central American countries. What should we be doing in Guatemala? Sen. Hart: I’m not going to give you a country by country synopsis. In the region, we ought to be cooperating more generally with other democratic allies—Mexico, Venezuela, Colombia, Panama—and there ought to be regional development banks, American manufacturing capability being exported and generally attempting to raise the standard of living, nutrition and so on. Q: Should we be accepting the recommendations of the Contadora group? Sen. Hart: Yes, very much so. Q: What about reports that the CIA backed Contras are killing civilians? What should we be doing about that? Sen. Hart: We shouldn’t be doing it. Q: We shouldn’t be backing them? Sen. Hart: I, for two years, very visibly and vocally, opposed this government’s policy, including that policy, in Central America. Q: Should we be backing anyone down there? Should we be backing El Salvador as we are? Sen. Hart: Only if they agree to end the death squads. Only when the death squads are completely eliminated should we be providing military assistance. And the economic assistance ought to be more carefully targeted. Q: How much control do we have over our money once we give it to them? Sen. Hart: Under this administration, very little, but it could be different. Q: Do you think Walter Mondale having accepted PAC money is still an issue? Sen. Hart: I’m not going to re-run this issue. Q: What about ’88? Are you going to be there? Sen. Hart: I hope Mondale is running for re-election. Q: You’ll support Walter Mondale? Sen. Hart: If he’s the President of the United States, I’ll be working to see that he gets a second term. Sen. Hart: That’s a long way off. Q: Do you foresee yourself running again? Sen. Hart: We have a national election on our hands right now and I think we’ve got to win that one. Free Speech Show – "Predictions for 2009"
James Tripp, Bill Bronner, John Fugelsang, Carrie Snow, and Angela Shelton discuss what they think the future of America will look like. Filmed December 14, 2008. James Tripp gives reasons to vote “Yes” in the upcoming SAG strike authorization vote. Does this mean there’s gonna be a file about me? Talking about the Strike Authorization Vote on "The Damage Report"
Here’s a link to a radio show I did today where we talk about the SAG strike authorization vote.